As its the world cup, I thought i’d share a little information on the trophy that is presented to the winning team. I wanted to write a post that would share the information that I found out while researching the Trophies themselves. So we’ll start from the beginning. It was designed by Abel Lafleur who was a very talented French sculptor. The cup is made of Gold Plated Sterling Silver. The base itself was made of White and Yellow Marble. The base was later replaced with a much higher base made of Lapis Lazuli. It was 35 centimetres tall and weighed 3.8 kilograms. It comprised a decagonal cup, supported by a winged figure representing the greek goddess of victory. The cup was later renamed “The Jules Rimet” Trophy to honour the FIFA president. In 1966 England hosts the World Cup. It was the 20th March, four months before the start of the FIFA World Cup in England and the trophy was stolen during a public exhibition at Westminster Central Hall. Incredibly it was found just seven days later wrapped in news paper at the end of a garden in South London by a dog named Pickles! As a security measure The football association secretly manufactured a replica of the trophy for use in exhibitions rather than using the original. In 1970, it was the next world cup and the original trophy had to be returned to FIFA for the next Tournament. FIFA had explicitly said no to The Football Association to make a replica Trophy so the replica had to disappear from public view. It was held with its creator for many years under there bed. Incredibly the replica was sold for £254,000 in 1997 when it was purchased by FIFA themselves because they thought it might actually have been the original. It was later identified as the the replica anyway. Brazil won the World Cup in 1970 for the third time meaning they could then keep the Trophy indefinitely as it was stipulated by Jules Rimet in 1930. In December 1983 the Original Trophy was stolen again, four men were tried and convicted but sadly the Trophy has never been recovered. It is widely thought to have been melted down and sold. Only the original base of the Jules Rimet Trophy has ever been recovered. In 1970, FIFA commissioned a new trophy to be made for the next World Cup in 1974. Over Fifty submissions were received from sculptors from seven different countries to design it. Silvio Gazzaniga’s Design was chosen. Gazzaniga was a very talented designer and sculptor and worked as Creative Director for “Bertoni, Milano” a trophy and medal manufacture in Milan, Italy. He tucked himself away for a week while he designed it. This is the same one used today and is engraved underneath the base with the year and winning country. The new Trophy stands 36.5 centimetres tall and is made of 5kg of 18ct Gold. It is thought to be worth approximately $150,000 and has a base made of two layers of Green Malachite. The making of the cup involved and extremely elaborate process of plasticine, plaster and wax casting. The trophy weighs 6.1 kilograms in total and depicts two human figures holding up the earth. Gazzaniga was very modest and down-to-earth, he described his emotions at the time as nothing more than “Happy and Proud” but admits he was a little overwhelmed when he saw his Trophy on the worlds stage for the first time in 1974. The process of making an engagement ring. 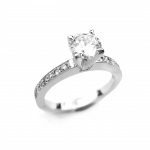 Engagement rings are beautiful, complex and detailed. There is a lot of time, design and craftsmanship put forward to make them. Thought needs to go into strength and how the piece will wear over time. With technology moving the jewellery trade forward in 2018 there are many new ways to make a piece of Jewellery and engagement rings are no different. CAD stands for Computer Aided Designing. This is the process of designing a piece of jewellery on a computer and printing the design out via a 3D wax printer. This model is then cast using a method called loss wax casting. The end result is an unfinished piece of jewellery that then just needs cleaning up. This style of jewellery making is great and it has open up the way jewellery is made today. It is however not how I make Jewellery. Call me old school or old fashioned but there is something about putting pencil to paper and sketching out designs that I feel much more personal and nostalgic. So upon meeting I workout with my clients what a rough design is going to be. If they have a picture of what they’d like already then theres sometimes no need for drawings. On the other hand if the design is not so straight forward then I would do a drawing to show how I think it would look. The next stage is making. We’ll keep it simple and say we’re making a Single stone diamond ring. The making can vary slightly depending on the design. Sometimes I might carve out the entire ring by hand in wax and then cast this wax model to get the finished ring. I would probably say more often than not I’d try and make it from the desired metal from the world go. So we start with a collet, this is the part that holds the stone. A collet is made to fit the stone exactly. In this process i’m constantly picking up the stone and measuring it against what i’m making. I start with a bar of metal and mill it out to the desired thickness and width. Then this is turned up into the shape of the stone, round for round stones, square for square stones etc.. If claws are to be holding the stone then the next stage is to add them. This is either done by cutting and filing out the collet or for a basket setting, wire is attached to the collet to make the claws. Once I’m happy with the collet and the stones fits perfectly its now time for cleaning it up and making the shank or band. For a simple parallel shank then i’d make up a band by milling out the metal to the desired thickness, width and length. The length is determined by the finger size of the client. Once the metal is the correct dimensions i’d then turn up the metal using half round pliers and joining the ends with solder. We now have a band! The band is heated to soften and then beaten round on a steel mandrel. We now have a collet and a band. I have to clean them both up by sandpapering and polishing. I also have to submerge them in an acid to remove any soldering Flux used in the solder process. I also like to give both parts a polish before I put them together. Next I measure the collet and remove a piece the same size from the band so that the collet will fit snug. This is then soldered into place and the cleaning process starts again before we set the stone in. Once the ring is clean and polished I then start setting the diamond into place. This is done by using a collet seat burr on a pendant drill. The seat is to be cut the exact size of the stone so that the stone sits now into the collet nice and snug. Once the stone is tight the claws are bent over and the excess claws are trimmed off. Were there, well almost anyway! Another round of polishing is required, the polish is washed off for the final time and dried on a polishing cloth. Besides Hallmarking thats it! Were there! The very basics on making a single stone diamond ring with a parallel shank band. I often get asked about Cleaning and Caring for Your Jewellery, whether its for a piece I’ve made or not. It really goes without saying that if you look after the jewellery you have it will last and stand the test of time. There are a few pieces of corse that will last longer than others even if you do nothing with them. For example if you own a pair of simple diamond stud earrings that you never take off, then these aren’t really going to get loads of wear compared to say a ring because there in your ears! They will however get very dirty very quickly if you never take them off! If however you are constantly taking them in and out every day to clean or you simply don’t like wearing them at night you may find that after a while the clasp holding them will feel a little looser compared to when you first brought them. General wear and tear! In my opinion, rings are the one piece of jewellery that should be looked after more than others. Bracelets, bangles, necklaces, pendants and earrings all of corse need looking after but rings generally are more susceptible to everyday wear. This generally means you just need to take a little more care of the rings on you fingers. I’m definitely not saying don’t wear them, but just be a little more conscious about wearing them at the gym or doing the gardening. If you wear a ring everyday and never take it off thats great, i’m a strong believer of wearing your expensive pieces. Whats the point of having a lovely piece of jewellery and only wearing it now and then. Well I’ve listed a few ways in which you take take care of your rings so you can keep them looking fresh and the diamonds sparkling. First off, if you wear hand cream and don’t take off your rings then they’ll need cleaning maybe a bit more often. The cream can get into lots of little holes and parts of the ring that can be much harder to clean. Some holes are there to let more light through, so if its clogged up with cream then the diamonds wont be looking there best. Heavy gym user and use free weights a lot? Your rings aren’t as strong as those dumbbells! Take them off or wear gloves. I’ve seen a lot of damage done by weights at the gym so by just padding up your hands with gloves will do the world of difference. Of corse if your job is very hands on then you will see your ring wearing more than someone who sits a computer or desk all day. I’m not saying take it off for work, its entirely up to you. I just want to make you more aware. A soft toothbrush works wonders! Hot hot water, making sure you don’t burn yourself, fairy liquid and a soft toothbrush. Use the toothbrush inside the ring to get into the little holes and round the diamonds. The hot water works to loosen the dirt and the Fairy works well as a degreaser to remove the oils built up on the ring. This is also very cost effective. There are other products on the market that work ok but in my experience this method works just as well. You need to be careful if you have a ring with other stones like Pearls or Turquoise as these cant really be submerged in hot water for long periods. They are very absorbent stones and contain natural oils that can be damaged if care isn’t taken. This might be more for a professional. For diamond rings on the other hand this method works wonders! If you have scratches that you’d like removed then this again is one for a professional. Don’t try and remove marks yourself as you could easily damage the ring. This generally isn’t too expensive, but varies from ring to ring and places to take them. I’d be more than happy to give you a quote, just get in contact via my Contact Page.